KUALA LUMPUR: Property developer Hua Yang Bhd has launched its first ever small office, home office (SOHO) development, Flexis@One South, with an estimated gross development value (GDV) of RM200 million. It is the fourth phase of the whole RM920 million One South integrated development. 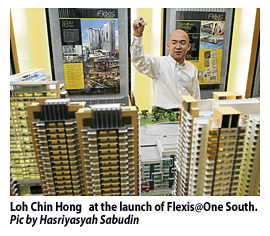 Hua Yang sales & marketing manager Loh Chin Hong said Flexis@One South features various architectural innovations and contemporary design styles that appeal to young and urban buyers, especially first time homeowners. “It caters to the growing mobile workforce, who are able to work remotely or from home, with the advent of information technology,” he said. In a press statement yesterday, Loh said true to its name, Flexis@One South allows one the flexibility in converting spaces for either home or office use or both. Two types of layouts are available, the typical single level units with built-up of 475 sq ft and 628 sq ft, and the duplex (split level) measuring 1,106 sq ft, 1,194 sq ft and 1,271 sq ft. The SOHO units are priced from RM250,000 which is suitable for individuals who are looking to purchase their first home or setting up a home office. Loh said this reflects Hua Yang’s continued growth as a developer whose quality products are still offered at an affordable price. Overall, One South consists of a soon-to-be completed street mall and two phases for serviced apartments, namely Parc@One South and Gardenz@One South. “Phase five and six are the final phases, which consist of the last block of serviced apartment and two blocks of office towers,” Loh said. PETALING JAYA: SP Setia Bhd will be embarking on a mixed residential development project with a gross development value of RM1.1bil in Penang after acquiring freehold land in the state. In a filing with Bursa Malaysia, the company said it had acquired 21.3 acres in the north-east Penang Island district of Timor Laut for RM185.6mil. Acquired via its wholly-owned subsidiary, Intra Hillside Sdn Bhd, the company said it would be developing an eco-themed project comprising terraced houses and condominiums. It said the land's proximity to Batu Ferringhi, well known for its vibrant beachfronts and one of the island's main tourist destinations, was a key attraction for investors looking to acquire prime freehold land in Penang. The proposed acquisition is expected to be completed during the second half of the financial year ending Oct 31. Singapore: A luxury bungalow in Sentosa Cove with a staggering S$108mil price tag. A huge, swanky condo unit in Cuscaden Walk on sale for a cool S$68mil. Homes are being tagged with a level of prices never seen before here. Online asking prices of S$50mil or more are now not uncommon. For instance, there are more than a dozen listings of good-class bungalows, mainly in the traditional upscale areas of Leedon Road and Victoria Park Road, with price tags at this level. But with asking prices significantly higher than market prices, some experts say these could be more of a marketing tactic to generate publicity for the particular home. So far, there have been only a handful of homes sold that have managed to cross the S$50mil mark, and none has exceeded the S$100mil threshold. But it was also important to look not just at overall prices but also at the unit per sq ft (psf) price when comparing these homes, experts added. For instance, the most expensive landed home sold here was a 41,850-sq-ft good-class bungalow in Leedon Park that changed hands for S$61.4mil, or S$1,467 psf, in December 2010. 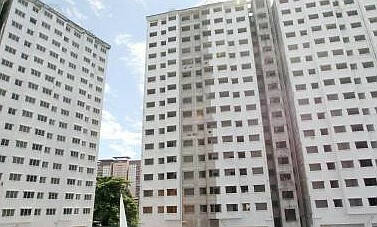 The record psf price is held by a bungalow in Chatsworth Road that went for S$2,081 psf, or S$22mil, in July last year. In the non-landed homes market, it was a 8,050-sq-ft Boulevard Vue unit that smashed records with a transaction of S$33.4mil in November 2009. But it was The Marq on Paterson Hill that caused jaws to drop with a 3,003-sq-ft unit snapped up at about S$6,850 psf or S$20.5mil. International Property Advisor chief executive Ku Swee Yong said that when a home was sold at 50% above the price of a similar home in the vicinity, alarm bells should ring and buyers should look closely at the specific attributes of the property to see if it was worth the premium. “It must have good attributes to justify why its price is so much higher than its neighbours. But if it is truly a good quality property, then buyers might still pay,” he added. Credo Real Estate executive director Ong Teck Hui said that in a rising market, a valuer might be able to support a valuation above the prices of past sales, taking into account how much the market had risen. But the valuer would not be able to justify a value beyond that, he added. However, there could still be demand for homes with high quantums as long as their values are at market rates. This was because the supply of some of these posh homes was limited, experts added. For instance, there are only about 2,400 good-class bungalows in 39 gazetted areas islandwide. They typically occupy at least 15,000 sq ft of land. Good-class bungalow developer George Lim said that he typically marketed his high-end homes discreetly through word of mouth, friends' recommendations or through a specialised agent. “When you reach that kind of price category, there are few people who can afford (such homes) and they are usually discerning and discreet. “They don't go online to look for homes as that is more for the mass market So you need to find a reputable agent who is known in the market and has the right connections,” he added. Among the online listings, the 99-year leasehold Sentosa Cove bungalow in Ocean Drive is the one with the highest asking price of S$108mil. At a whopping S$5,436 psf of land area, the bungalow comes with six en-suite bedrooms and sits on a double plot with a sea view. Its price is almost three times the overall price record of S$39mil for a bungalow sold in the exclusive estate in March, and more than 80 per cent higher than the record unit price of S$2,989 psf achieved in October 2010. Other expensive homes listed include a 40,500-sq-ft good-class bungalow in Queen Astrid Park with a price of S$64mil, while another 26,500-sq-ft bungalow in Belmont Road would require a buyer to fork out about S$50mil. Even condos are nudging well above S$50mil asking prices. A six-bedroom 11,200-sq-ft unit at Boulevard Vue in Cuscaden Walk is listed with a guide price of S$68mil. Another 9,000sq-ft five-bedder unit at Skyline@Orchard Boulevard is asking for S$55mil. To be occupied soon: The abandoned Phase 1 low-cost flats in Jalan Kuang Gunung, Taman Kepong. BUYERS of the abandoned Phase 1 low-cost flats in Jalan Kuang Gunung, Taman Kepong, can expect to move in by August next year after waiting for almost seven years. Housing and Local Government Minister Datuk Chor Chee Heung said the landowner would fund the project because the developer had been declared bankrupt. “The ministry will continue monitoring the project until it is completed,” he said, during a visit to the project with 540 units. The project began in May 2003 and Phase 1 was scheduled to be completed in 2006 but was abandoned with 81% completed as the developer, Gallant Acres Sdn Bhd, was declared bankrupt on March 5, 2008. Chor then ordered the landowner — Kepong Development Sdn Bhd — to find funds amounting to RM14mil to complete the project. In 2010, the landowner and project’s liquidator — Tentuan Hals & Associates — were given six months to get a court order to restart the project. Phase 1 of the Li Garden Apart-ment and condominium project consists of three blocks of low-cost flats and 12 shoplots. Phase 2 consists of 396 low-cost units. Kepong Community Centre head Yee Poh Ping, who has been championing the issue on behalf of the buyers, said the project would be completed between December this year and February next year. “However, the buyers can only move in around August next year as we still need time to apply for the Certificate of Fitness and get approval for other utilities,” he said. Chor said 100 out of the 177 abandoned housing projects had been revived and completed since 2009. Out of the remaining 77 projects, Chor said 51 were still under construction while the other 26 were still under discussion for revival. “Most of the projects are low-cost schemes. “We want to concentrate on helping low-cost house buyers,” he said. KPJ Healthcare Bhd's unit, Kumpulan Perubatan (Johor) Sdn Bhd is acquiring a parcel of commercial land in Tebrau, Johor for RM45 million. In a statement to Bursa Malaysia here today, KPJ said a private specialist hospital would be built on the 5.4-hectare land, which in turn would expand its customer base thus contributing positively to the company's yearly financial performance. The company said the newly constructed hospital would be the only specialist private hospital within Taman Bukit Mutiara and Bandar Dato region. It said the new hospital, which would cater to local and international market, would also be equipped with centre of excellence facilities for outpatient and specialist practice for cardiac, geriatric, cancer, orthopedic and cosmetic. The proposed acquisition was expected to be completed in the fourth quarter of this year. OSK Property Holdings Bhd recorded a higher pre-tax profit of RM19.36 million for the first quarter ended March 31, 2012 compared with RM12.05 million in the same period in 2011. Revenue, however, fell to RM51.04 million from RM61.16 million previously. In a filing to Bursa Malaysia today, it said the improved pre-tax profit was due to higher sales achieved for its Bandar Puteri Jaya, Sungai Petani, Kedah project and higher contribution from Sutera Damansara project in Sungai Buloh. "In addition, certain phases of these projects have reached advanced stages of construction, thus resulting in increased percentage of profit recognition," it added. encouraging home ownership among first-time buyers and its commitment in the implementation of the Economic Transformation Programme, the group's diverse range of properties was expected to be in demand. The company planned to undertake industrial development of small- to medium-sized industrial factories on the industrial land in Shah Alam. "This project will enable the group to diversify its development portfolio to include small, medium industrial factories and to expand its geographical coverage to Shah Alam," it said. The group would continue to focus on its goals to enhance its performance level while continuously improving customer service as well as maintaining efforts towards effective cost-saving measures. Hektar Asset Management Sdn Bhd, the manager of Hektar Real Estate Investment Trust (Hektar REIT), today announced it has obtained the Securities Commission's (SC) approval for its proposal to increase its fund size and list new units on the Main Market of Bursa Malaysia Securities Bhd. With the approval, Hektar REIT is looking to increase its fund size by up to 93.859 million units to a maximum of 413.855 million units. Approval was also given for the valuation of two retail properties in Kedah to be acquired by Hektar REIT, it said in a statement. The properties are Landmark Central Shopping Centre and a major portion of the Central Square Shopping Centre, which are collectively worth RM184 million, it said. The RM181 million acquisition of both malls at a purchase consideration price will also increase REIT’s gross asset value to RM1 billion, it said. Hektar REIT's enlarged net lettable area is expected to increase by about 52 per cent after Kedah malls proposed acquisition. "Our next step is to meet our unitholders to obtain their approval for the proposed acquisition and rights issue through an extraordinary general meeting,” said Datuk Jaafar Abdul Hamid, Chairman and Chief Executive Officer of Hektar Asset Management Sdn Bhd. HONG KONG: China's property chickens are coming home to roost. Last week's economic data show that a year of falling prices is finally changing developers' speculative behaviour. 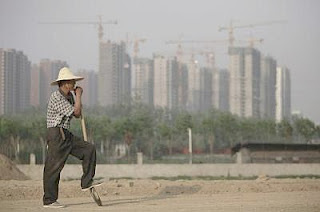 After years of boom, most developers, like many investors, have acted as if the downward move were no more than a blip. When barred from getting bank credit, many property companies found funds elsewhere, notably through so-called trust companies, which make loans funded by short-term retail funding. Throughout 2011, developers merrily continued to add new floor space at the same rate as they had a year earlier. April's data show there has been a rude awakening. The amount of housing floor space completed dropped 56% from the total figure for January and February, months usually lumped together to account for the New Year's holiday. The shift is more than seasonal the drop off was a milder 35% in the previous two years. Space under construction also failed to show its usual post-New Year spike. Overall, residential real estate investment grew 4% year-on-year in April a tenth of the rate of a year before. Adjust for inflation, and that's equivalent to no growth at all. Since new property development accounts for about a tenth of China's gross domestic product building, a modest slowdown will be enough to cause overall economic activity to sputter.